A big thank you to CSNStores.com for sponsoring this fun giveaway! If you’re not already familiar with CSNStores, they are made up of more than 200 online stores and sell everything from kitchen appliances to swing sets for kids. They have an amazing selection, and are well-known for their good customer service! Lately our days have been spent browsing seed catalogs and daydreaming about our future garden, so I thought it would be fun to put together a themed prize package. One lucky Frugal Family Fun Blog reader will win a fantastic kids gardening prize pack courtesy of CSNStores! 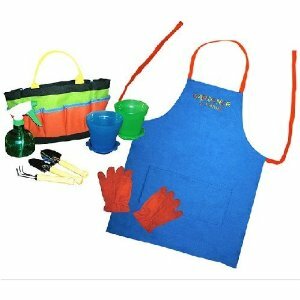 Prize pack includes a Sassafras Kid’s Deluxe Gardener in Training Kit (photo below) including an apron, two pots, gardening gloves, 3 gardening tools, sprayer, and gardening bag…. Yay!! But wait! That’s not all…. 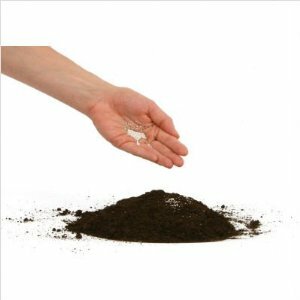 With St.Patrick’s Day coming up, you might want to plant some of these Auld Sod Official Irish Shamrock Seeds for extra good luck! Wait… there’s more!! 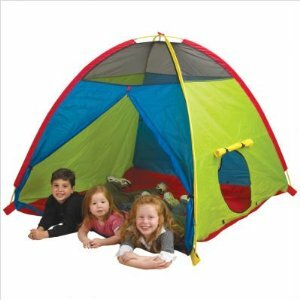 And I thought maybe the kiddos would want a place to relax a bit after they’re done planting all those seeds, so how about a Super-Duper 4 Kid Play Tent by Pacific Play Tents? Isn’t this a super-fun prize pack? To enter for your chance to win, leave a comment on this post. Feel free to tweet/blog/facebook about this giveaway for extra entries, just be sure to come back and leave a comment for each extra entry. Giveaway is open to all US residents. Winner will be chosen at random. Giveaway ends Saturday, March 5th @ 6:30pm EST. im a gardener so this would be perfect! Also shared on facebook! Sounds fun! Cool—I will share this on fb too! very cool, my 3 little boys would love this!!! will share your link! Shared on my blog as well!! 😀 I moved from AZ to MD and am excited to live somewhere that actually has soil to grow things in. I have too been day dreaming about what I will pland with my 6 kids this summer! I just found your blog through a homeshool list and can’t wait to dive into some of your projects with my boys. And this gardening kit would be perfect for my little earthworm March birthday boy! Wow, What a great giveaway! My daughters love the outdoors, and we can’t wait till spring! How exciting this would be for them if we win! My 3 year old helps in our community garden and this would be perfect! What a great giveaway! My kids would love this. Thank you! My two boys are really ready to start having more time outside. So excited to for a bit of warmer weather and less cold wind. Love, love, love the gardening kit! I can’t wait for spring so my daughter and I can work in the garden together! My kids would love this… and it perfect for them to use with our garden this summer!